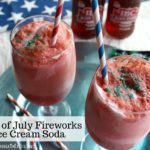 Ice cream sodas are a joy of summertime! Which one is your favorite: a classic root beer float? A scoop of orange sherbet atop bubbly 7-Up? Or how about a scoop of vanilla in a chilly glass of Coke? Creamy, cold and carbonated: such bliss. 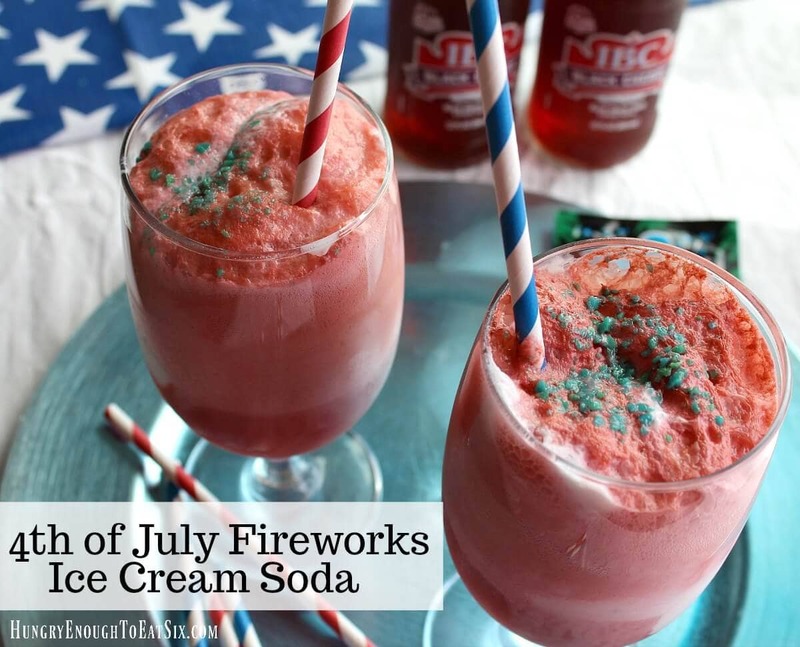 This 4th of July Fireworks Ice Cream Soda has a red, white and blue hue, just in time for the holiday! Sweet, cherry soda is the red part of the drink. Check your local grocery, I was surprised at how many varieties of cherry soda I found! Some were sweet, dark cherry and others were cherry-lime with an almost neon shade of bright red. 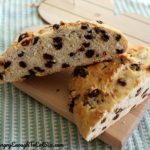 In my house we preferred the flavor of deep dark cherry soda, but do your own taste test to see which you like best! 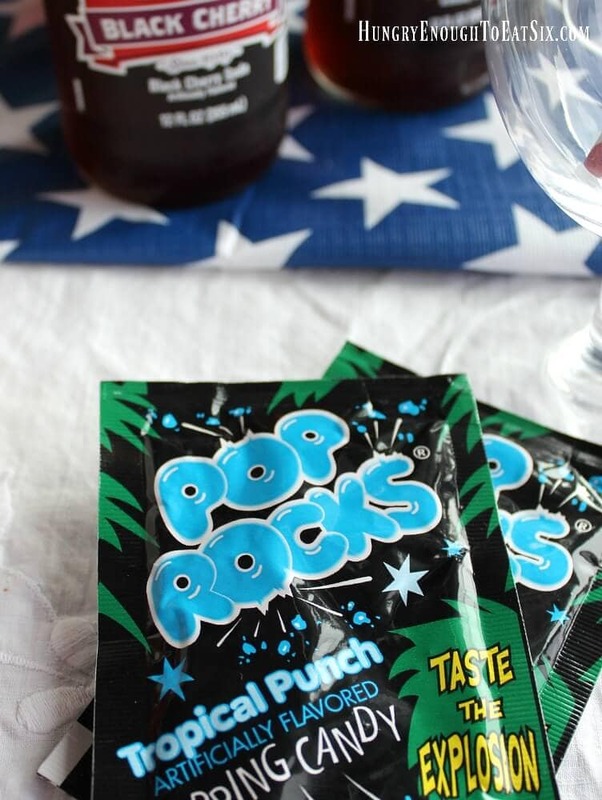 To get blue Pop Rocks, look for the Tropical Fruit Punch flavor. 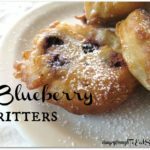 Stir the Rocks into softened ice cream to get a swirl of blue in the creamy white. I found that the flavor of the Pop Rocks does not change the ice cream flavor in the final scoops, but hey, you’re still getting the cherry and vanilla. Though you don’t get Pop Rocks flavor, that lovely blue does show. Pockets of undissolved candy in the ice cream, plus a sprinkle over the top give you the delightful snap, crackle and pop on your tongue! 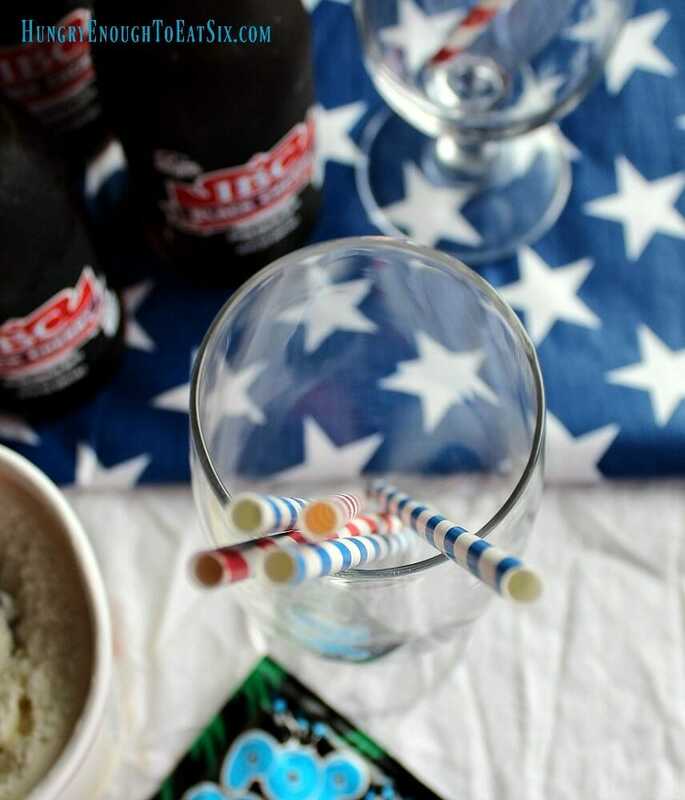 Red soda, white ice cream, blue Pop Rocks, and a little fireworks action in your mouth! 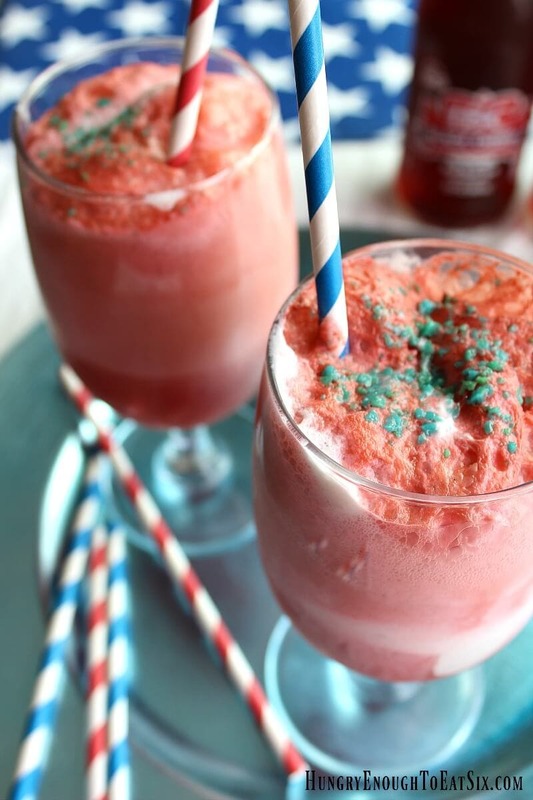 This is a delicious cherry ice cream soda with a surprise ingredient to really get things popping! 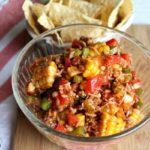 It's a red, white and blue treat that's perfect for this summer holiday. 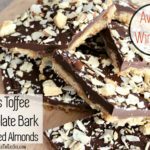 Open one package of Pop Rocks and pour them over the softened vanilla ice cream. 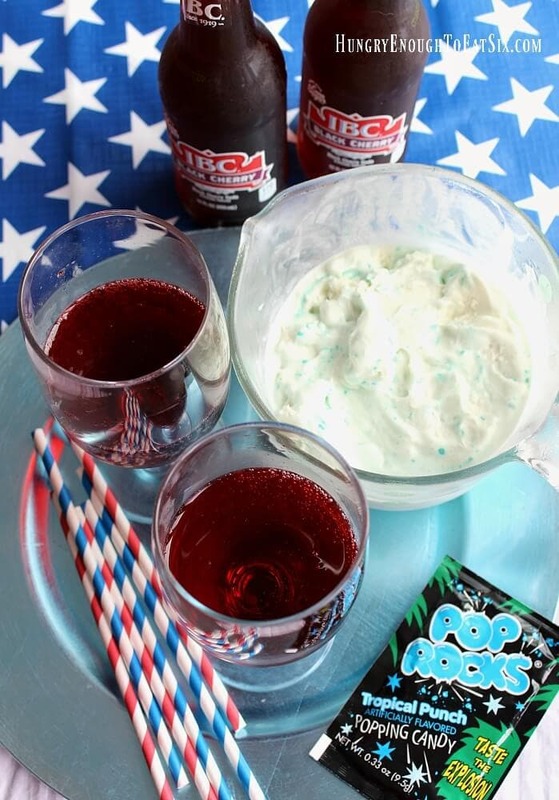 Stir them together just until the Pop Rocks leave streaks of blue through the ice cream. You want the streaks to be bright and visible. Cover the ice cream with plastic wrap, pressing it to the surface of the ice cream and place it in the freezer. Freeze the ice cream for 1-2 hours until it has firmed up. 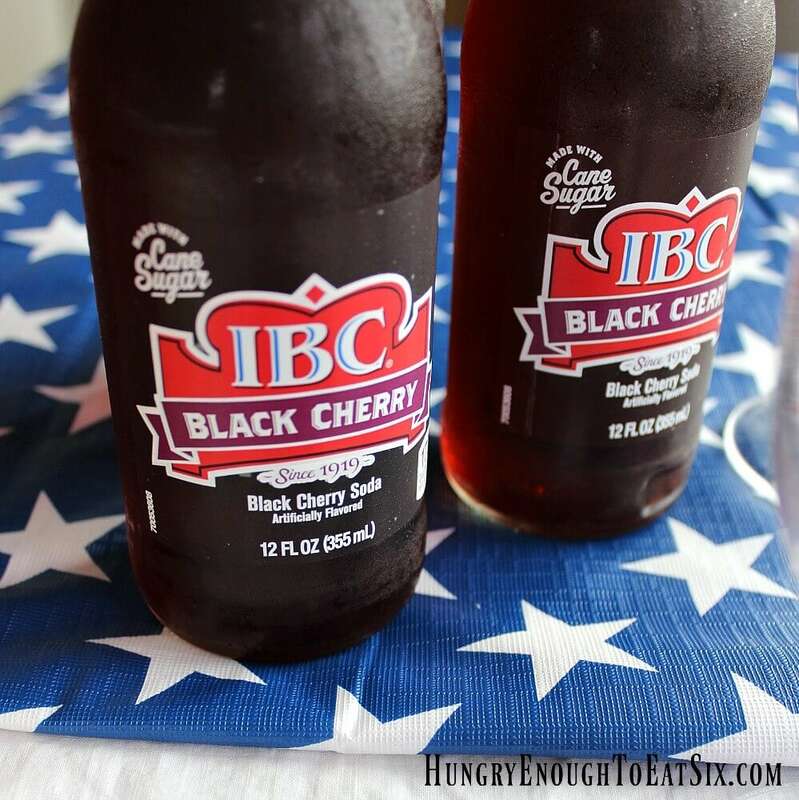 Divide the cherry sodas between the four chilled glasses, half a bottle into each glass. 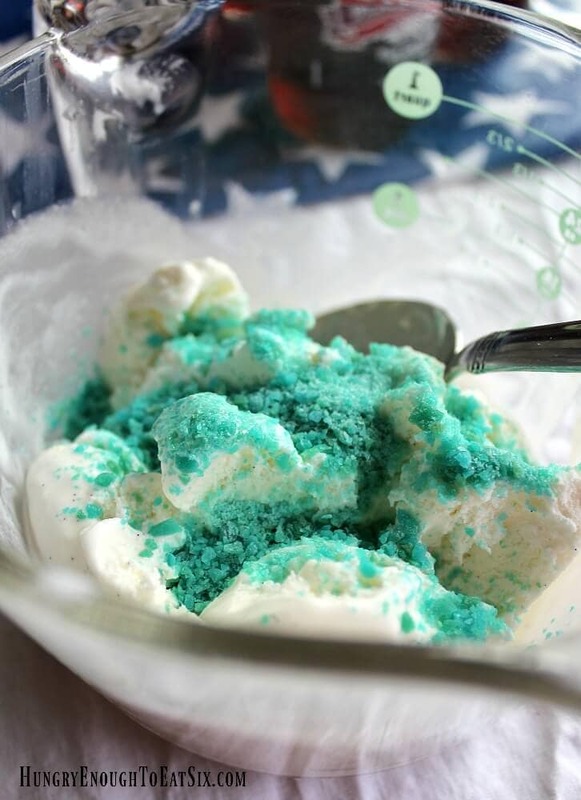 Use a 1/4-cup scoop and gently place two scoops of the Pop Rocks ice cream into each glass. 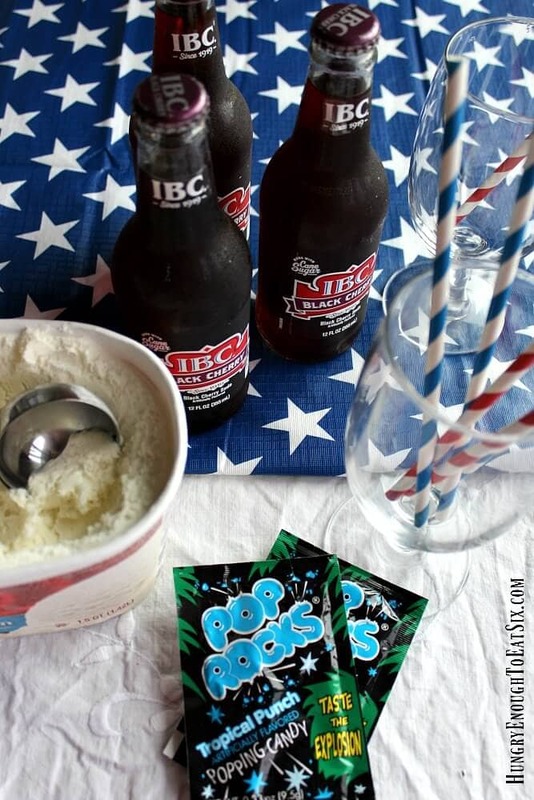 Open the second envelope of Pop Rocks and sprinkle them over the top of the ice cream sodas. Place straws into each glass and serve them immediately, along with a spoon for each. 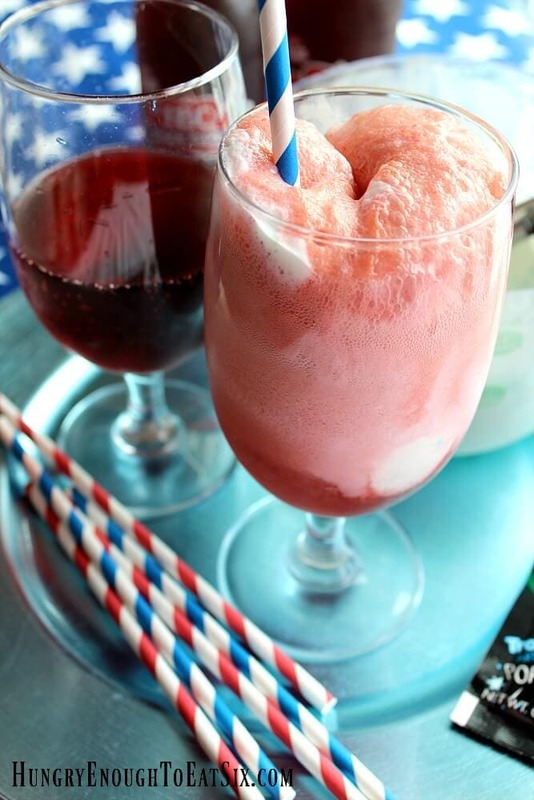 Note: I know of at least one brand of clear cherry soda, and of course there are cherry *colas* but you want to find a cherry soda that's a brilliant shade of red for your red, white and blue 4th of July Fireworks Ice Cream Soda!